I just... sigh. Really? You finally have a likable female recurring character on the show, so of course the best thing to do is kill her. 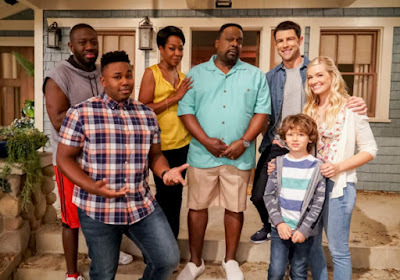 I know it's "finale time" and all that, so the stakes must be big and whatever, but personally I'm disappointed that they killed off Charlie. One more time: sigh. But fine, I'll get to the recap, because that's what I do. Sam recruits Charlie to help decode the Book of the Damned, because Rowena is having a tough time, as apparently the codex is also coded. He calls in Castiel to help keep the peace between the two, while he goes back to help Dean on a case and pretend like they aren't doing all of that in secret. The case they're working on this week brings back the Styne family from some episodes back, who are in search of the book. In performing a ritual, one of the sons, Eldon, kills a girl and leaves the body along with video of him jumping from three stories and landing perfectly fine. You know, not weird and suspicious at all. The brothers catch wind of this, but the Stynes are on the lookout for them as well, and try to corner Dean while he's out getting pizza. Dean kills one of them, but captures Eldon. Meanwhile, back at the mysterious wherever-it-is place where the other three are working on the book, Charlie is getting rattled by Rowena's many comments about her. And it all started to become clear here that they were heading in the direction of killing her, even though I didn't want it to happen. While Castiel takes Rowena into another room to giver her some space, Charlie decides to be an idiot and bolts to go to a motel for true alone time. Seriously? 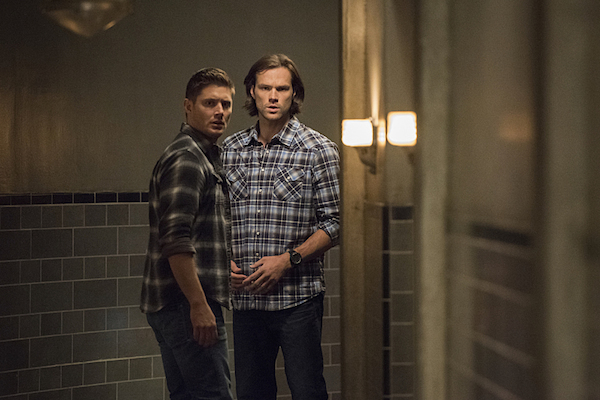 Because back with the brothers, Dean is getting some information out of Eldon that seems rather hokey, but whatever. Apparently Styne is actually short for Frankenstein, and the family has been around for centuries causing mayhem for their own profit. He also lets slip to Dean that the book can't be burned. So, Dean leans into Sam about it all and finds out the truth - that he's been secretly working on a way to get rid of the curse. Dean is rightly pissed, especially after Eldon escapes. After, you know, just tearing off his arm. He tracks down Charlie to the motel she is holed up in just as she is able to crack the code. Though she manages to get the Winchesters on the phone, and they tell her to just give the dude what he wants, she instead uploads the code somewhere and then destroys the computer. She holds out a knife to defend herself against Eldon, but the dude is all Frankenstein-y, so when the brothers show up to save her, they're too late. And time for another sigh. Meanwhile, Crowley is a bit bored and talking to the woman Rowena transformed into a hamster some episodes back. The hamster tells Crowley about some person who is involved in something or other, and sends one of his minions off to find said person. At this point I still have no idea what Crowley's end game is here, and this didn't really help things. - Well, is anyone else as disappointed as I am that Charlie died? She was one of the few lighter characters in this dark Supernatural world, and I'm kind of pissed they killed her off. - What exactly happens if they do manage to get the Mark off of Dean, anyway? Aren't there some kind of consequences? You know, a price or something? They were hinting at always needing a balance for things in life, so what would the balance be here? - I don't really know what Castiel or Crowley's goals are at this point. Rowena just kind of wants to cause havoc and get rid of the Mark and Crowley himself, but the other two guys? Yeah. - If this family has been around so long, causing so much havoc, how have they remained under the radar from hunters and the like? Sure, the Men of Letters had stuff on the Stynes, but they didn't connect them to Frankenstein or anything. Seems like something they would have connected. - Two more episodes to go. I'm not even sure what I'm hoping for. Sam: So now we need to break a code... to break a code? Dean: They helped Hitler get started, and God knows what else. Probably disco. Charlie: Of course, he doesn't know. Jeez, the two of you. Rowena: Hell's Bells. More distractions. Which are you, witch or nerd? 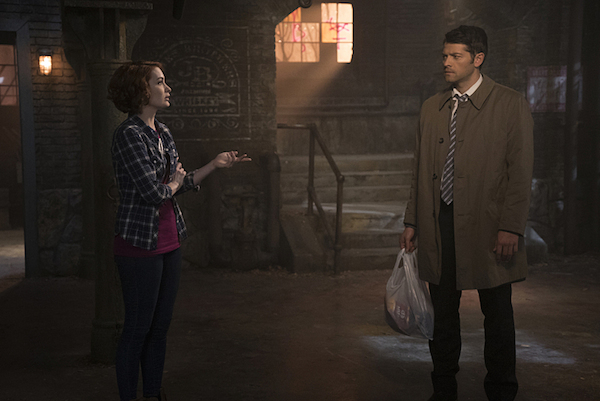 Castiel: When I was human, I grew very fond of these pork rinds. Crowley: Fail on pain of infinite pain.